We are nearly coming to the end of the Mega BM, today is Day 24 and brings with it the most difficult letter X. Its so difficult to find dishes that begin with X. When I was thinking of Indian Cuisine and Indian flatbreads, Xacuti comes to mind which is a fiery Goan spice blend. I thought of making the spice blend and instead of using it in a curry which its usually used for, I wanted to add it to the dough to make fiery masaledar parathas. Then what made me change my mind? My mum.. bless her soul. 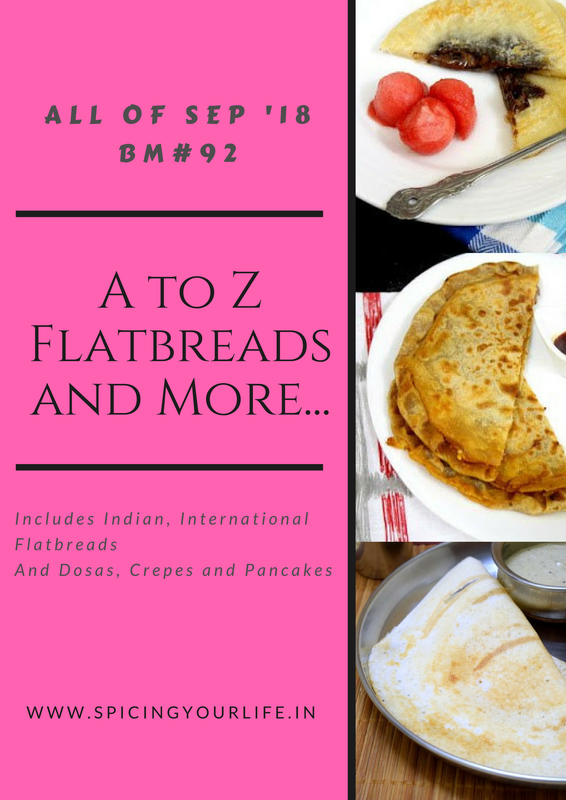 When I was looking at the dates when I would be posting the flatbreads, a flatbread beginning with letter X fell on 28th September, my mum’s birthday. As some of you may know my mum made few traditional dishes but made them well. I’ve posted most of the dishes that she made well except for her famous farsi puri. She did not make the normal kind that most of us make. Hers were the flaky and crispy type. We all use to love them, my dad would dunk it in tea, we would get them in our break box (at that time there were no lunch boxes). So I thought how do I make her flaky farsi puri for the Mega BM. Members know that when we’re doing this mega marathons whenever we get stuck with a letter, adjectives come to the rescue. For me the word Xtra came to the rescue. As a former teacher I would not encourage the use of the word Xtra as that’s not the correct spelling but desperate times require desperate solutions. So here’s to my dearest mum, her famous xtra flaky crispy farsi puri. Remembering you on your special day. Hope you are happy and at peace where ever you are. Xtra flaky farsi puri is usually enjoyed as a snack on its own or with some tea or coffee. It also makes a nice salty travel snack. Whenever we would travel to Mombasa by road my mum would make these puris. We’d stop at the petrol station, use the washrooms, fill petrol and at the same time open our hampers and enjoy the food packed by my mum and other families who would travel with us. Usually my dad’s friends and their families and us, would all travel together to Mombasa for our annual holiday. Back then we didn’t take numerous holidays in a year, it was only one and that too on Christmas Day. My dad would close the shop in the evening and we’d travel at night. Since we would be so many, my mum would prepare the puris a week ahead. I would help her to smear the paste on the rolled dough, she would roll it up tightly and then I would help her to cut them into pieces and press them gently. Later on the duty progressed to helping her to roll them into small puris. Mix the rice flour, cornflour and ghee and make a paste. Leave it on the side. To make the dough mix the flour, coarse pepper powder, cumin seeds and salt. Add water and make a dough that is not soft and not too hard. Knead the dough for a few minutes. Cover the dough with a damp tea towel or a cotton cloth and let it rest for 30 minutes. Divide the dough into 4 parts. Roll each part into a ball and flatten it between the palms. Using a little bit of flour (not too much), roll each dough part into thin circles of about 8 inches in diameter. Place one rolled dough or roti on the work or rolling board. Smear the paste over it, till the edges using a pastry brush. Place the second rolled dough or roti on it. Smear the paste over it. Place the third rolled dough or roti on top of it. Place the last roti or rolled dough over it. Smear it with the paste. Roll tightly the stacked circles or rotis like a Swiss roll. Cut into 10 equal parts. Take one part of the 10 pieces and place on the rolling board with the cut part facing up. Press it down gently. Roll into a 3 inch diameter flatbread. Repeat steps 18 and 19 with the remaining pieces and keep them on the side till the oil becomes hot. Heat the oil for frying in a wok or karai over medium heat. Drop a tiny piece of dough in the oil. If it sizzles and comes up immediately then the oil is ready. Drop the 3-4 rolled puris at a time into the hot oil over low to medium heat and fry till it becomes crispy, the layers open up and it turns light pink in colour. Take it out of the oil using a slotted spoon and keep in a colander for the extra oil to drain out. When it becomes cool, layer the air tight container with a kitchen towel and store the farsi puris in it till required. Don’t use too much ghee or oil for smearing otherwise the puris will open up on frying. Its best to tuck the end part under the puri so it does not open up on rolling and frying. Can replace the ghee with melted butter or oil. Can add carom seeds (ajwain, ajmo) instead of cumin seeds. Wow, how flaky those farsi puris looks. Am just drooling here, look at those flakiness, cant resist to them. You have done a beautiful job for X. Loving it to the core yaar. OMG! What a way to pay tribute to your mom. These look simply out of the world. I would love to have them with tea as well. Thank you so much.. just a coincidence that letter X came on her birthday. These are so tempting and would surely fit the bill as snacks..very nicely done and lovely reading about your Mom, what a lovely way to remember her. Thank you so much Srivalli, the right recipe on the right day. These are so gorgeous flaky pooris Mayuri. A wonderful way to remember mom. With tea, these must be absolutely yum. The pictures speak volumes on how crisp the puri is! Wow! My kids will definately love to have this in their snack box and lunch box!What a nice way to remember mom! Thank you so much Paddmajha. wow Mayuri di you have nailed this recipe perfectly. so flaky, each layer is visible. Looks so tempting and inviting to try out. You should have added few clicks for the process. Bookmarking it. really have not seen such puris. What a wonderful tribute to your mother. Those farsi puris are xtra special and xtra flaky. Just by seeing the pictures, I can feel how light and flaky they are. Thanks Sandhya and yes they are light and flaky. Didn’t last beyond 2 days in my house. I have no words to explain how much I liked it. How can someone make it so perfectly, each layer visible separately. I’m just in awe with this.